Back when the iron curtain was firmly in position, a car manufacturer called GAZ was producing luxury cars from within the Soviet Union. 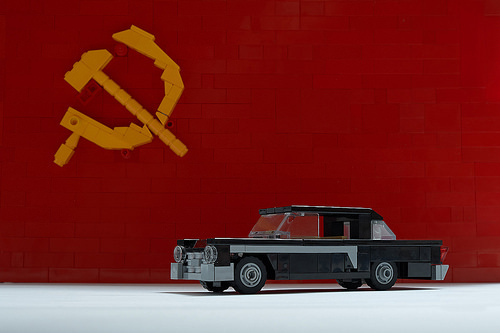 Anton Creator has built one of their car models in LEGO, the GAZ Chaika (Rus: Ча́йка), which means gull. The boxy car is a throwback to a time when big meant luxurious and mpg efficiency did not feature highly when prioritising car choice. While the car is a great little built, it is the background that really brings this whole build to life. The red flag of the Union of Soviet Socialist Republics hangs in place with a gold hammer crossed with a gold sickle, symbols of communism and socialism. I must ask Anton where the fallen star has gone?